0 - 25 Low Health risks: Not expected. 26 - 50 Medium Health risks: Not expected for the general population. 51 - 100 High Health risks: Acute health effects are not expected but chronic effects may be observed if one is persistently exposed to such levels. 101 - 200 Very HighHealth risks: People with existing heart or respiratory illnesses may notice mild aggravation of their health conditions. Generally healthy individuals may also notice some discomfort. 201 - 500 Severe Health risks: People with existing heart or respiratory illnesses may experience significant aggravation of their symptoms. There may also be widespread symptoms in the healthy population (e.g. eye irritation, wheezing, coughing, phlegm and sore throats). Well, this year has seen levels over 300 here in Beijing. Frequently it's between 100 and 200, though today it's very good having had rain for many hours yesterday. On a point of health out here (and incidentally more than half a million people die in China every year from pollution related illnesses) I went to visit a friend in hospital on Sunday who has appendicitis. It was a pretty shocking experience. Beds and chairs all packed together in old corridors and rooms, people wheezing and coughing all over the place with the humid stench of sweat, disease and pollution in the air. Pale men and women sitting glassy eyed with UVs in their arms and families washing their relatives in full view of everyone else. There are clearly problems in the British health system too and in fact several Chinese people I met looked down on the NHS a great deal when they came to Britain, but I left the hospital feeling angry and frustrated. We had called my friend who was sat in the chair waiting to see a doctor to see if he wanted anything and he said that all he wanted was for us to bring him some water. One thing which is hugely frustrating in China is that there are so many people working in restaurants and cafes (often the high numbers are government imposed), on building sites and on the roads (service is always very very fast) yet the bottle necks where experience and education is required seem to be a long way from being eased. I'm sure that my one view of Chinese hospitals isn't always the case, but the department I went into looked to be near critical mass. A note on pollution which I'm in two minds about: From the 7th to the 20th of this month a million cars will be taken off Beijing's roads to see how the pollution is affected. At the same time some of the coal burning power stations will be turned off. We are now at one year to go until the Olympics and this is a trial run. It's great that Beijing may have a couple of weeks of lower pollution levels. The world is supposed to see and rejoice that Beijing is a truly developed, modern society, after which the city will return to its normal choking state and the population will continue to die in their thousands. The problems of Face continue to plague my views of China. 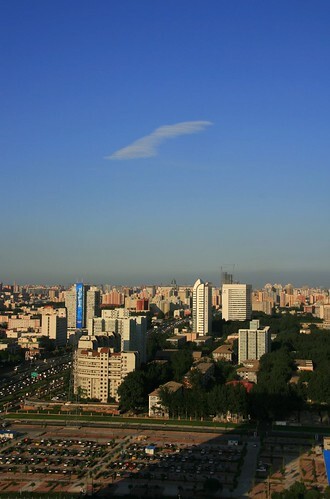 That 's a great picture of Beihang! Ah, that's where Beihang is! Thank you.